In a nonstick pan start cooking your sausage on medium low. In another nonstick pan on medium heat, add a little oil and start cooking your potatoes and eggs. Add the slices of jalapeno to the eggs. 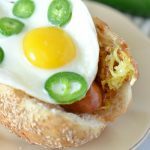 Once the ingredients are fully cooked slice open your roll and add the potatoes, sausage, and eggs. Serve for breakfast or even dinner!